Charles “Chuck” Caldwell first came to Gettysburg in 1936 on a family vacation and then again in 1938 to attend the 75th anniversary of the Battle of Gettysburg as a 14-year-old boy. Now 92 years old and a Gettysburg resident, Caldwell has since attended the 100th, 125th, and 150th anniversaries of the battle. He has also become a part of the history that he loves so much. The 75th anniversary of the Battle of Gettysburg was the last great reunion of Civil War veterans. About 2,000 aged men gathered in the fields between the Peace Light Memorial and Gettysburg College. Caldwell was there to meet with as many as he could and ask them about the Civil War. To mark the occasion, he has an autograph book filled with pictures of him with the Civil War veterans and their autographs, Civil War units, and hometowns. He even has the autographs of the men who turned out to be the last surviving Union and Confederate veterans. Caldwell was stunned. He knew from his roommate’s tone that something was wrong, but he wasn’t quite sure what. He knew the Japanese had been fighting China and talking aggressively toward the United States. They had to dig out an atlas to locate Pearl Harbor. Caldwell had already been in the process of joining the Marines when this happened. He completed his enlistment after Christmas and began his training at Parris Island in January 1942. During WWII, he served in the Pacific Theater and fought at Guadalcanal, Tarawa, and Guam. He received a Purple Heart for wounds he received at Guadalcanal, where he also contracted malaria. At the end of the war, he married Jacqueline “Jackie” Murphy, who served in the WAVES (Women Accepted for Volunteer Emergency Service). They met in the hospital while Caldwell was recovering from a malaria attack. After the war, Caldwell went back to the University of Alabama on the G.I. Bill and by the time he graduated in 1949, he had a job waiting for him in Oak Ridge, Tenn. Caldwell made displays and drawings for the newly formed Museum of Atomic Energy. He worked there for about a year until he was recalled to service for the Korean War. Although he didn’t have to fight in this war, when he returned home, he decided to switch jobs. He took a job doing technical drawings for one of the plants in Oak Ridge. Because this job was boring, he was willing to volunteer for summer work in Nevada. He spent the summers of 1957 and 1958 setting up sensors in fake towns in the desert. When an atom bomb was detonated, he was part of the teams that would go back into those towns to try and find any of the fissionable material that they had set up for the test. “I bet I am one of the few people still around who has actually been under an atomic explosion,” Caldwell says. After one explosion, he headed toward ground zero. When he came up over a hill, he said the mushroom cloud was still rising in the sky. In the early 1960s, Caldwell became a full-time artist sculpting miniatures for a variety of clients including Major League baseball teams, the Franklin Mint, and the Ringling Bros. Circus Museum. Some of his miniatures were even displayed in the Knoxville World’s Fair. He moved to Gettysburg in 1980 and opened a shop on Baltimore Street where he sold his original miniatures. They have become collector’s items over the years, with people stopping by Caldwell’s shop from all over the country and some foreign countries to buy one. 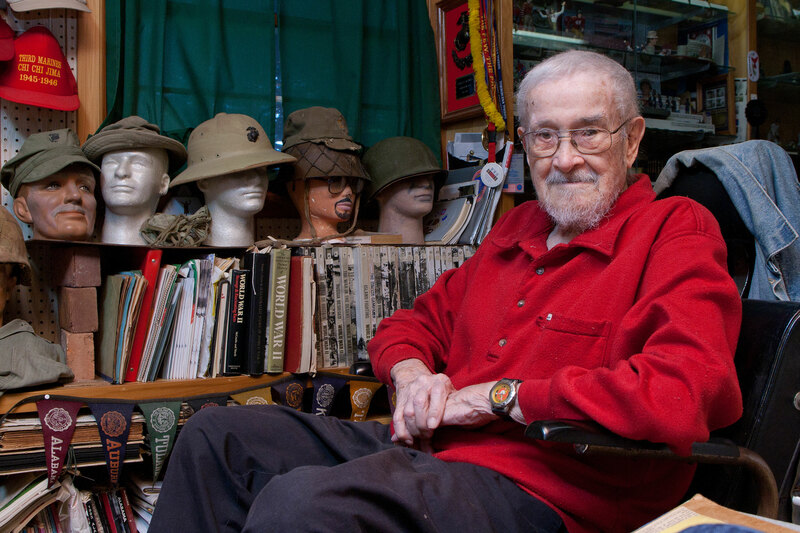 Caldwell’s multifaceted life will be featured in a biography due to be released later this year called “Clay Soldiers: One Marine’s Story of War, Art & Atomic Energy” by James Rada, Jr.
Great article. Chuck has been my close friend for over 30 years and I have had him do over 100 figures for me. He truly is a treasure and this attention is well deserved. Just captivated by his 11/11/16 interview on Voice of Veterans. Must sit my stepson down and have him learn by watching. Incredible stories. Incredible life. Incredibly humbling and inspiring. I have two great Civil War Figurines done by Chuck Caldwell: “Johnny Reb” dated 10/88 and – and “Gettysburg’s own K Co 1st Pa. Reserves (30th Pa. Inf.) – I think the date reads 6/90. Does anyone have any idea what they are worth? Thanks!